The Drive Unit of the Bosch eBike system is available in the variants Performance Cruise (25 km/h) and Performance CX, as well as Active Cruise. Whether in the flow through the city, on extensive trails, or in alpine terrain, with the right support you can make every trip into your own personal eBike moment. The Drive Unit Active Cruise provides perfectly metered assistance up to 25 km/h. It is available on eBikes with chain and hub gears – on the latter optionally with backpedal function. The drive concept impresses with powerful electronics and a low-vibration motor. The optimized 3-sensor concept measures 1000 times per second with maximum precision for optimal power tuning and a new, unique riding experience. The arrangement of the gear system provides for optimal integration of the Drive Unit design and for more ground clearance. The reduced volume results in lower weight of the Drive Unit and a smaller pedal distance, thus increasing the ergonomics. In addition to the premium Platinum version, the ergonomic eBike system recognized with the Red Dot Award for outstanding product design is now available in an inverse version with black as the main colour. The Performance Line is designed for athletic and powerful riding and does justice to its name. Its dynamic drive impresses with high-performance support on any terrain: from flat to steep, from asphalt to trail. The Drive Unit invariably masters every style of riding. The difference is the technology behind the design of the components. The drive system convinces with powerful electronics and a low-vibration motor as well as low volume and weight. The optimized 3-sensor concept measures 1000 times per second with maximum precision for optimal power tuning and a new, unique riding experience. The optimal balance of performance and range is also a matter of pure enjoyment. 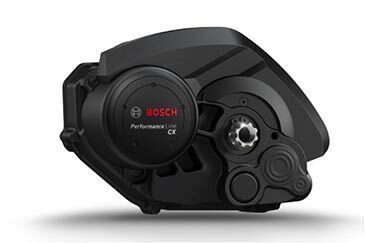 The Performance Line CX features a clearly noticeable increase in performance, with 75 Nm of maximum torque. This is further enhanced by the Drive Unit with a smaller housing and rugged powder coating. It provides powerful acceleration and the ultimate uphill flow when eBiking off-road or in the mountains. Experience long-lasting power up to high cadences for sporty acceleration even in alpine terrain. In this way Bosch is making a clear statement for a completely new riding sensation and exceptional pedelec experience. Select the battery that suits you. Bosch Power Packs are available in Australia with 400, and 500 Wh as frame or rack batteries for the Active and Performance Line. Common to all is their high energy density, exceptional mileage, long service life, low weight, and easy handling. Reliable, durable energy storage without memory effect and self-discharge – that defines the rechargeable batteries PowerPack 400. The Battery Management System (abbreviated to BMS) protects the batteries against overload, under voltage, and overheating. High-quality Single-Cell Monitoring (SCM) measures the voltage of each individual cell. PowerPack 400 are lithium-ion batteries with 400Wh, available as rack or frame batteries, the latter sits very close to the center of gravity, which has advantages in manoeuvrability. The battery is mounted on the rack on bikes with low entry. No matter where they are attached – removal and charging of the batteries at the next outlet is simple. Thanks to the handle and mount, the batteries can be easily inserted and removed again. The only thing easier is charging the Power Packs directly on the pedelec. Lithium-ion batteries have neither memory nor self-discharge effects. This means the Power Packs can also be partially recharged at any time – without affecting the service life. With increased range, the new PowerPack 500 is the perfect choice for e-mountain bikers, athletic riders, commuters, and everyone who wants to ride further distances. The lithium-ion battery has the highest energy density with the smallest possible size and lightest weight. Available as a frame or rack battery, the PowerPack 500 adds more capacity and performance to the battery series. In this way you can ride up even steep mountains or on trails with obstacles on your tour. 40-cell packs with the highest energy density (190Wh/kg) on the market and the lowest weight and volume. 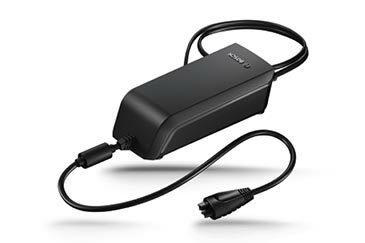 More power with an unchanged size as compared to PowerPack 400. 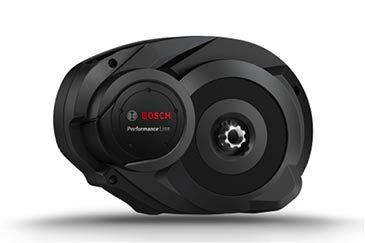 The Bosch Power Packs combine high power and high performance. In this way you can travel long distances and climb even the steepest mountains. With the on-board computer Intuvia, you control your pedelec experience easily and intuitively. The display, which is easy to read even in sunlight, informs you reliably about your current speed, distance, trip time, and range. Intuitive operation using the separate control unit. Using the integrated USB interface, you can charge mobile devices such as your smartphone while you are on the go. Even when it is removed, Intuvia makes all tour data available at the press of a button. Outstanding readability, exemplary ergonomics, and excellent handling. Five riding modes can be selected – Eco, Tour, Sport, Turbo, and Off. Intuvia is now also available with a Swedish and Portuguese language menu. Value retention, durability, and safety through care and timely maintenance of all components of your pedelec at your Bosch eBike dealer. Your system detects whether you are in the optimum range of the Drive Unit and recommends a higher or lower gear. Using simple arrow symbols. The result: a more pleasant riding experience and optimum range. In anthracite-coloured and platinum-coloured design in accordance with the Performance and Active Line, the on-board computer Intuvia Active presents itself as the control center of the eBike. It features simple, intuitive, and safe operation on the separate control unit. Switching between the five riding modes plus walk assistance and calling up information such as speed, charging state, distance, and much more could not be easier. Even when removed from the eBike, Intuvia remains a useful information tool that makes it possible for you to retrieve all your tour data. The new shift recommendation shows an arrow to indicate the optimum moment for shifting gears. In this way you conserve both your own energy as well as battery power. A USB port also allows you to charge external hardware such as smartphones and MP3 players. With Intuvia Active, high-precision distance measurements are now possible even after a wheel change. The eBiker himself can make fine adjustments to the wheel circumference at the touch of a button. The five available riding modes – Turbo, Sport, Tour, Eco, and Off – can be easily and conveniently selected via the separate control unit without it being necessary to take one’s hands off the handlebar. 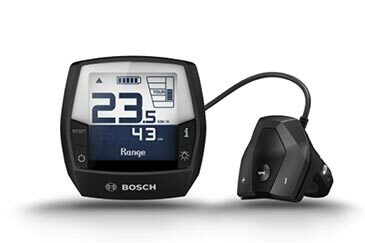 Bosch offers the right riding mode for every riding style and every eBiker. The Bosch eBike System provides five different riding modes to choose from. The right one for every eBike rider and every riding style. How fast do I ride? How far can I still go? And wasn’t this hill steeper before – or is that due to the selected support recommendation? With a glance at the operating computer Intuvia on the handlebar, these questions can be answered for the eBiker faster than they come up. The five available riding modes – Turbo, Sport, Tour, Eco, and Off – can be easily and conveniently selected via the separate control unit depending on trip distance and the rider’s wishes, and even without it being necessary to take one’s hands off the handlebar. The new shift recommendation shows an arrow to indicate the optimum moment for shifting gears. In this way you conserve both your own energy as well as battery power. The integrated walk assistance can also be controlled using Intuvia. When it’s time for a break, you simply remove the operating computer to read the tour data at your leisure. And because Intuvia even has a USB port, you can use the modern eBike operating computer to charge your mobile phone or MP3 player even while you are on the go. Bosch Chargers are compact, lightweight, and rugged. And above all, really fast. To allow you to enjoy your eBike experience without interruption. With the Bosch eBike Charger, the PowerPack 400 are fully charged in no more than 3.5 hours. 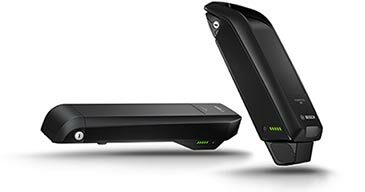 The new PowerPack 500 reaches its full charge in no more than 4.5 hours. Charging to 50% only takes approx. 1.5 hours with the PowerPack 400, and approx. 2 hours with the PowerPack 500. The Bosch eBike Charger is only about as big as a water bottle and very lightweight, at just 800 grams. The Travel Charger weighs even less: The charging device for on the go weighs less than half a kilogram. An ergonomically shaped charging plug facilitates handling, and the very compact dimensions make the unit easy to stow in your luggage. The closed housing make the Charger stable and resistant to dirt, and charging does not make any disturbing noises.